with music beat.The LED music light strip follows the beat and adjusts flashing to fit the strength of the sound. enjoying music. And because it has sound sensor, the under car glow system synchronize with music beat. grille, under foot-wells, in the trunk, along the dash, etc. 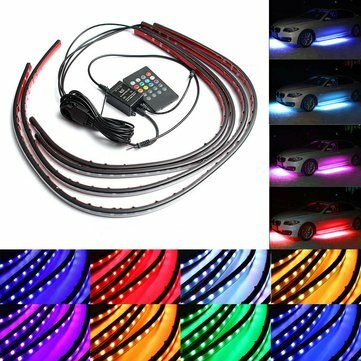 and Yellow.The under car glow system has also fifteen(15) color flashing modes, perfect for synchronizing with the beat of music. want to put them on.Even though they're really bright, they're great power savers so you don't have to worry energy consumption.